Name one problem that comes to mind whenever you're brushing your teeth. If the first thing that came to mind is a bleeding gum or sensitive gums, you'll probably want to read on. What are the cause of bleeding gums? Bleeding gums are most often a sign of gum disease, but can also point to a number of other health problems. Occasional bleeding of the gums can be the result of brushing your teeth too vigorously or wearing dentures that do not fit correctly. Just a month ago I was given a tube of TruCare as a trial. 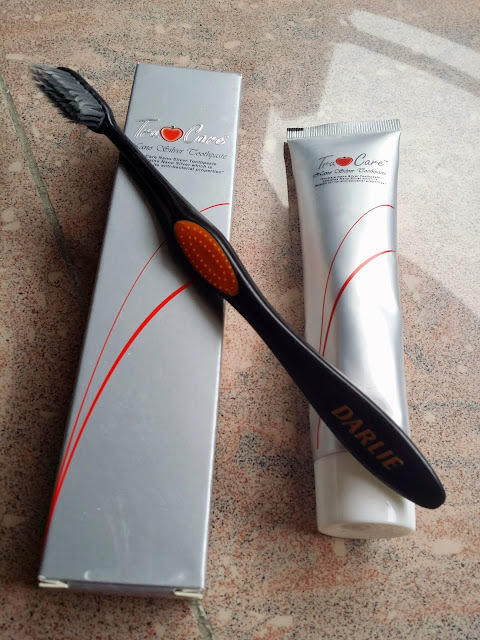 It was said that this product is perfect for those with sensitive gums and I couldn't wait to try it out. TruCare's Nano Silver Toothpaste is the ultimate all-in-one oral care solution that contains Ag+ RapidHeal Factor. Ag+ is known to heal ulcers, gum aches and sore throats within just a few days' use and helps combat microbes and pathogenic organisms that cause bad breath. Used regularly, it will help accelerate the healing process of ulcers and other oral problems resulting in not only a fresher breath, but also rids your mouth of potentially harmful bacteria. Well after a month's usage, I'll say this, I've not manage to make my gums bleed even if I deliberately tried brushing harder and longer. Don't believe me? Just check out this video I've recorded while trying out the toothpaste. By the way, not only does the toothpaste prevent gum bleeding while brushing, it also helps in curing ulcers as well as sorethroats. I've tried other gum sensitive toothpastes before (which I shall not name) and there was one in particular where it's toothpaste were slightly red and it tasted HORRIBLE upon using it. Which I have not used anymore since.